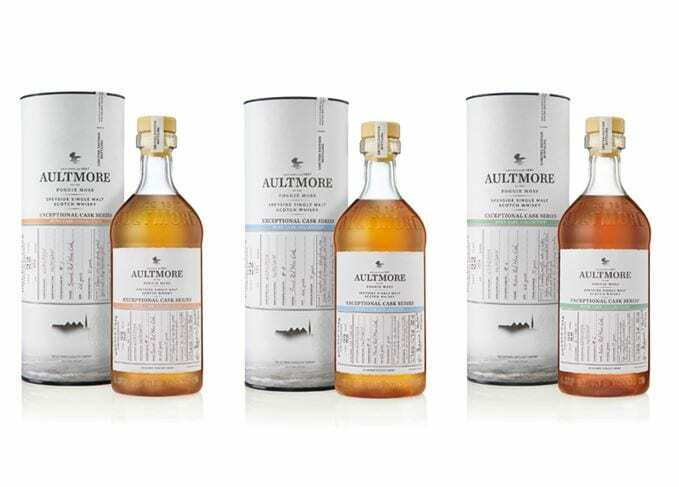 Speyside distillery Aultmore is launching its new Wine Cask Collection – a trio of 22-year-old expressions exclusively for sale at London Heathrow Airport from this week. The three single malts have been matured for 11 years in a combination of refill ex-Sherry and ex-Bourbon casks, before being transferred into one of three different ex-wine casks – Super Tuscan, Châteauneuf-du-Pape or Moscatel – for a further 11 years. Aultmore 22 Years Old Super Tuscan Finish has been matured in casks said to have previously held ‘one of the world’s greatest Cabernet Sauvignons’. Described as having notes of ‘buttery toffee, unctuous vanilla and concentrated floral aromas’, the whisky is bottled at 52.1% abv and is priced at £360, with only 108 bottles available. The ‘glorious and rich’ Châteauneuf-du-Pape casks are said to have imparted ‘luxurious, deep red fruity notes’ and ‘the scent of honeysuckle’ to the whisky. Bottled at 52.1%, only 144 bottles of Aultmore 22 Years Old Châteauneuf-du-Pape Finish are available, priced at £340 each. Aultmore 22 Years Old Moscatel Finish is described as ‘vibrant, with ripe fruits, potent spices and a long, luxurious finish’. Only 222 bottles of the Moscatel Finish are available, also bottled at 52.1% abv and priced at £320. To mark the whisky’s launch next Thursday (18 April), Aultmore global brand ambassador Georgie Bell will be in duty free stores at Heathrow Airport, running tasting sessions throughout the day. The launch coincides with Heathrow’s annual Whisky Festival, which runs throughout the month of April. Speyside distillery Glenrothes has also released a Heathrow exclusive to coincide with the festival, a 19-year-old limited edition single cask whisky.